Have you ever seen a more impeccably dressed chic woman in the blogging world than Crystal Hammon of Dressed Her Days Vintage? If there is one person who has the ability to style vintage pieces into today’s hip-style, look no further. We'd love to take a sneak peek at her closet and see her full wardrobe! From her blog photos, you can tell that each item is unique, has character, tailored and fits her perfectly. We’ve asked Crystal to answer a few questions about her blog, style and source of inspiration. Enjoy and be inspired! What’s the reason behind the blog name? Dressed Her Days rhymes with “yesterdays!” It seemed compatible with my tagline: “Life in yesterday’s clothes.” Like a lot of women, I tend to chronicle my life by what I wear, so the name fits. That name also gave me latitude to cover lots of topics. 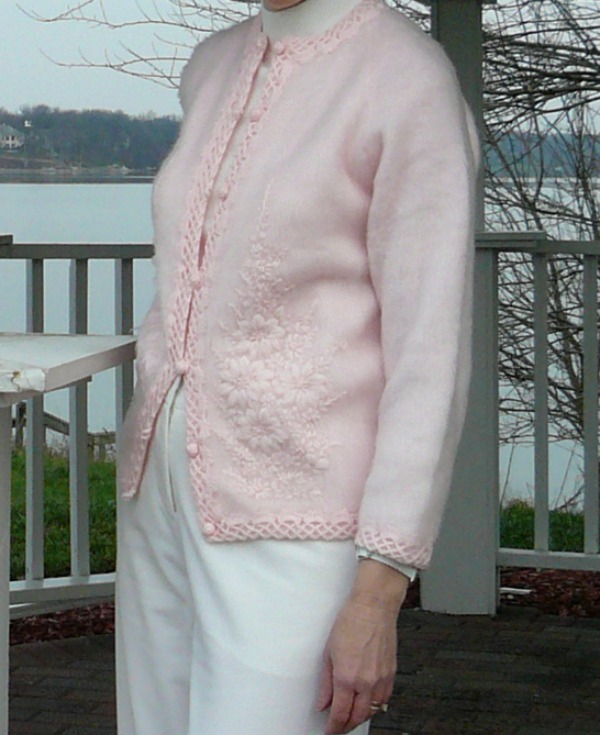 Sometimes, the blog is about what I (or someone else) wore yesterday or yesteryear. Other times, it’s about what happened yesterday or yesteryear—in life OR in fashion. 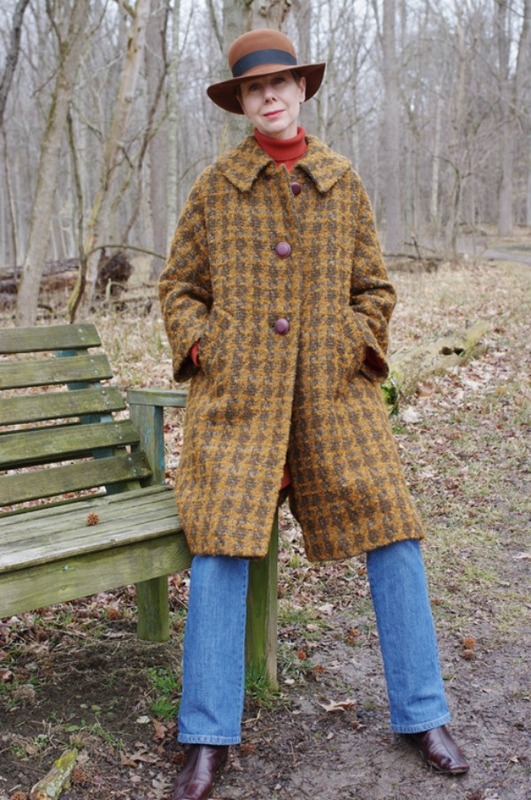 I have a vintage fashion focus, but it’s not all I write about, and it’s not all that I wear. When did you start blog and what made you start blog? I started this blog in 2010. I’m a writer by profession, but I took a hiatus in 2004 to become a librarian. Six years into that career change, I got the itch to return to writing. I wanted to augment my portfolio with current work that showed prospective clients I could still write—and had been doing so every day. 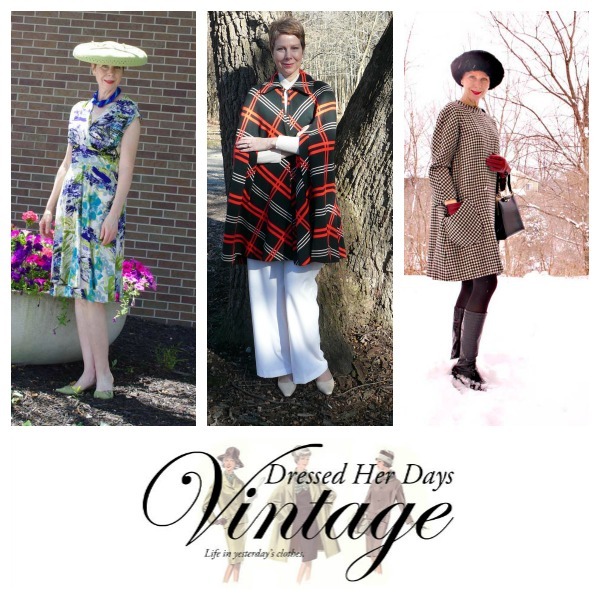 Dressed for Days: Crystal shows a deft hand when it comes to styling great vintage pieces into a modern fashion look. When I transitioned back to my writing career, the blog added to my portfolio and demonstrated that my skills were still current. Blogging helped me inch my way back to being a full-time writer. Since then, it’s become a way to stretch occasionally. It helps me keep a nice, long stride, so I never get in a rut with writing. I get to write about anything I want, however I want, both of which seldom happen with paid work. As a little girl, all I wanted was to write for a fashion magazine. Dressed Her Days Vintage is my fashion magazine and my dream come true. You’ve gotta love what the internet has done for having a creative life of some kind—no matter what you do for money. How has your blog evolved through the years? When I started, I linked the blog to my online vintage store, which was very expensive and cumbersome to build. Then I realized what an idiot I had been to bite off such a task when Etsy has such a marvelous tool for sellers. I redesigned the whole site, and moved everything to my Etsy store. About that time, my writing business started to groove, and I needed to make a choice. Writing matters to me most, so I’ve temporarily abandoned the idea of selling vintage. For now, the blog is simply about passion and friendships. Over time, I think I’ve also grown more courageous about letting the blog integrate all parts of my life. They say you should never talk about money, politics and religion, but I reached a point where I started to feel hypocritical about things I left out. How could I call myself a Christian in my private life, and be afraid to mention God’s name on my blog? I never want to offend readers who have a different point of view, but this is who I am and what I want. It’s not authentic to completely leave that out. You know what they say: my blog, my rules. Religion isn’t the focal point of the blog, but when it’s appropriate to the content, I’m not afraid to say the G-word anymore. What’s your most popular post? Why do you think it was the most successful? I wrote a post about what to wear to a western-themed wedding because a friend of mine was puzzling over that question. I guess there are a lot of people out there who can’t imagine what’s appropriate for such an occasion! Where do you see your blog 5 years from now? The hardest thing in the world writing content that’s useful to other people. It’s easy to create a fashion post or express an opinion. I’d like to write more content that helps other people solve problems. How has your style changed through the years? How do you describe your style now? For most of my adult life, I had a very tailored style. 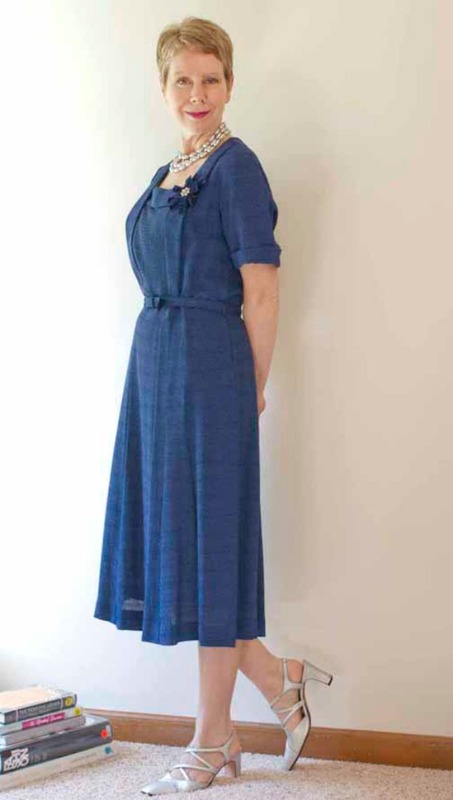 It made getting dressed pretty easy, and it worked for me because it was also economical. As I’ve aged I realized that traditional styles made me look and feel old. So, I definitely feel more adventurous than I was in my 20s. There are days when I’m working at home all day, and I don’t want to fuss too much over my clothes. When I go somewhere, it’s a different story. I feel like my clothes are a form of communication. More than anything, I don’t want to be boring. And I despise being judged or dismissed because of my age. I didn’t like it when I was a young adult, but it seems really unfair now. I think my style is in a metamorphosis. I’m still adjusting to changes in my body. I still lean toward really simple lines, but I experiment with proportion, patterns and color more than ever. I only wish I had done this when I was younger! 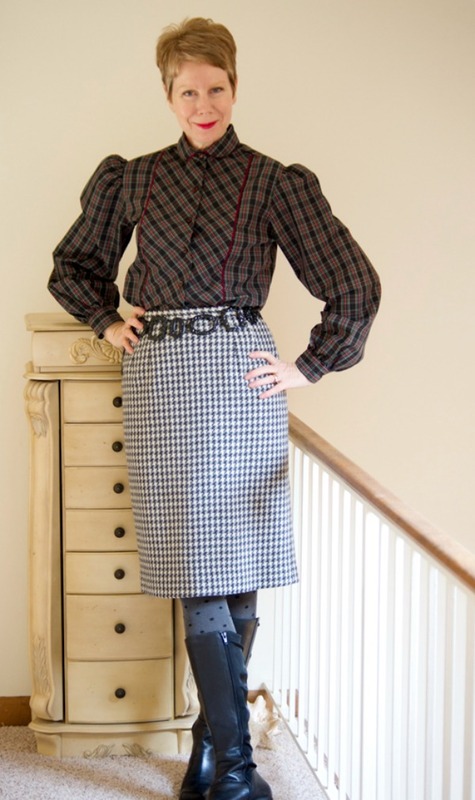 CITIZEN ROSE-BABE: Crystal explores pattern mixing in a CRV vintage plaid blouse and houndstooth skirt. A lot of your readers are inspired by your looks but where do you get style inspiration from? Other favorites: Bag and a Beret and Mis Papelicos. These women give me such a feeling of happy freedom! I also read a lot of fashion books about famous designers from the past like Dior and Chanel. It’s fun to reinterpret those looks in contemporary ways. What made you start thrifting? Can you recall what started you to thrift or recycle clothing? I started thrift shopping when thrifting wasn’t cool. Earlier in my career, I worked in a large manufacturing environment where I interacted with people all through the organization, from people who made things to the CEO. That meant in a typical day, I spent time on a dirty manufacturing floor and in business meetings. If I got ink or oil on a thrifted suit, there was a whole lot less to cry about. It also just made sense when I considered my priorities in life—which included not spending everything I made. What percentage of your closet is thrifted/consigned/second hand/vintage? I guess my closet is a 30 percent vintage, 30 percent consigned, and 30 percent thrifted…but that’s a guess. Regret anything you thrifted? Please share! If you could give tips on what to look out for in thrift shops, what would they be? 1) Buy things you can’t otherwise afford. I’m brand-choosy only when I thrift shop. Why would I pay $5 at a thrift store for a blouse that came from Target when I could buy the same blouse on sale for $5—at Target. I look for huge spreads between the thrift price and the retail price. I can’t be bothered with cheap brands because there is no spread. 2) Use your thrift shopping to experiment. Over the years my style has changed and so has my body. Sometimes, I can sense it’s time to make a change in my look, but I literally don’t know how to pull it together because it’s not what I’m accustomed to wearing. When you don’t know if something will work on your body, thrifting is the answer. It gives you artistic license to try new looks without investing a fortune in something that doesn’t work. You don’t have to feel guilty about a bad decision; you can recycle it all over again! 3) Have a sense of adventure as you thrift shop. I look for things that are in good condition, carefully checking for stains and rips. Generally, I won’t buy something that’s damaged. That said, occasionally, I’ll find something that’s terribly unique and terribly well-loved. In that case, I’ll consider repairing it or refashioning it into something else. I also look for curtains and other household fabrics that can be made into garments, which is very fun. b. Carry it in a plastic bag and immediately place it in your dryer for 45 minutes; then wash it. If it’s something that will shrink in a dryer, let the first cleaning be done by a dry cleaner. Reason: heat is the only thing that kills bed bugs. This is something everyone needs to be concerned about—I don’t care who you are! Care to share your favorite shops (local or online)? For vintage, my favorite local shop is Queen Bee Vintage. I also keep my eye on Bella’s Etsy store. She’s got an eye! For vintage jewelry, I love Rose and Thatch. For vintage hats and accessories, I love Road Less Traveled. She’s a flight attendant and I get the feeling that she picks up treasures from all over the world! Can you give 5 things your readers do not know about you? At this point, there’s probably not much that a regular reader doesn’t know about me from the blog, but I’ll try for one: I have a cat phobia. If you have a cat, I’m sure it’s very special and very meek, but it would still terrify me. Interested to connect with Crystal? Check out her links and show her the love! 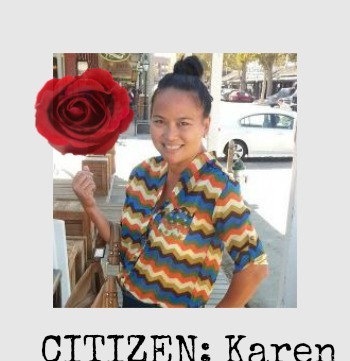 Karen writes about her life and style at Mrs.LookingGood. She's a Sacramento mom balancing being a Thrifty & Stylish blogger, Mamapreneur and Playdate Guru. I love Crystal's styling always. Her look is sophisticated and fringed with whimsy. Beautiful. Her thrifting tips are spot on, and I am especially devoted to the ones about price spread and cleaning. Her tag line, "Life is short. Wear the good stuff" is also one to live by. Thanks for featuring this interview, Bella. PS I'm honoured to be mentioned by Crystal. And thanks to Mrs. Looking Good, too! Beautiful style. I love the second look!! Lovely style and great interview! Thanks for introducing me to Crystal - she does a wonderful job of integrating unique vintage pieces into her daily wardrobe. These blogger features are great; keep up the good work.